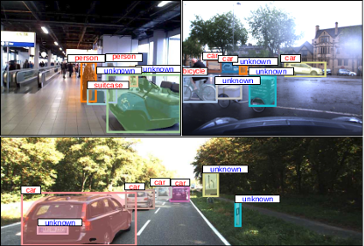 Research in vision for robotics and dynamic scene understanding: Generic Multi-Object Tracking and Segmentation, 3D Reconstruction, Dynamic SLAM, Object Discovery, and Open-set/Few-shot Learning-in-the-wild. Travel junkie. Never stop exploring. Coffee/beer enthusiast. Occasionally barking at the moon. 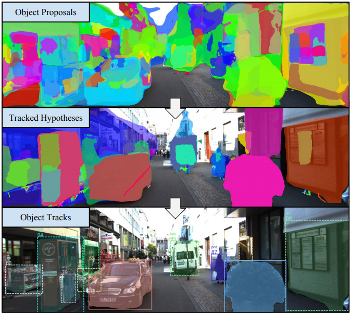 Tracking in urban street scenes is predominantly based on pretrained object-specific detectors and Kalman filter based tracking. More recently, methods have been proposed that track objects by modelling their shape, as well as ones that predict the motion of ob- jects using learned trajectory models. In this paper, we combine these ideas and propose shape-motion patterns (SMPs) that incorporate shape as well as motion to model a vari- ety of objects in an unsupervised way. By using shape, our method can learn trajectory models that distinguish object categories with distinct behaviour. 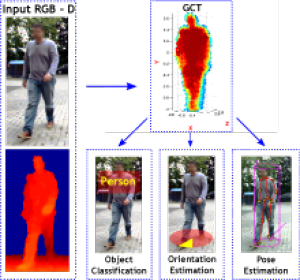 We develop methods to classify objects into SMPs and to predict future motion. In experiments, we analyze our learned categorization and demonstrate superior performance of our motion predictions compared to a Kalman filter and a learned pure trajectory model. We also demonstrate how SMPs can indicate potentially harmful situations in traffic scenarios. 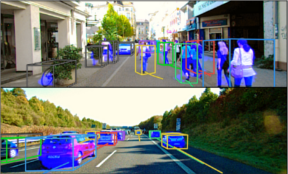 Scene understanding is an important prerequisite for vehicles and robots that operate autonomously in dynamic urban street scenes. For navigation and high-level behavior planning, the robots not only require a persistent 3D model of the static surroundings - equally important, they need to perceive and keep track of dynamic objects. 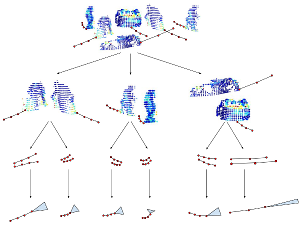 In this paper, we propose a method that incrementally fuses stereo frame observations into temporally consistent semantic 3D maps. In contrast to previous work, our approach uses scene flow to propagate dynamic objects within the map. Our method provides a persistent 3D occupancy as well as semantic belief on static as well as moving objects. 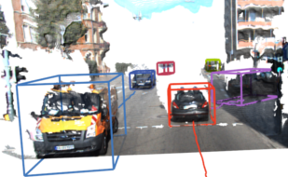 This allows for advanced reasoning on objects despite noisy single-frame observations and occlusions. We develop a novel approach to discover object instances based on the temporally consistent shape, appearance, motion, and semantic cues in our maps. 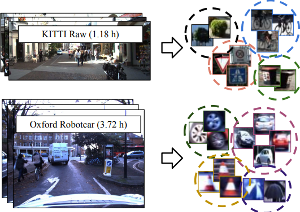 We evaluate our approaches to dynamic semantic mapping and object discovery on the popular KITTI benchmark and demonstrate improved results compared to single-frame methods. In this paper, we present a novel, robust multi-view normal field integration technique for reconstructing the full 3D shape of mirroring objects. We employ a turntable-based setup with several cameras and displays. These are used to display illumination patterns which are reflected by the object surface. The pattern information observed in the cameras enables the calculation of individual volumetric normal fields for each combination of camera, display and turntable angle. As the pattern information might be blurred depending on the surface curvature or due to non-perfect mirroring surface characteristics, we locally adapt the decoding to the finest still resolvable pattern resolution. In complex real-world scenarios, the normal fields contain regions without observations due to occlusions and outliers due to interreflections and noise. Therefore, a robust reconstruction using only normal information is challenging. Via a non-parametric clustering of normal hypotheses derived for each point in the scene, we obtain both the most likely local surface normal and a local surface consistency estimate. This information is utilized in an iterative min-cut based variational approach to reconstruct the surface geometry. 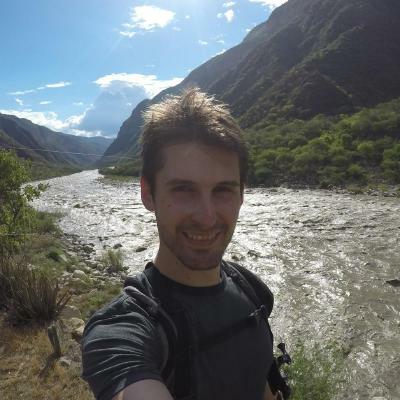 In this thesis, we address the problem of image-based 3D reconstruction of objects exhibiting complex reflectance behaviour using surface gradient information techniques. In this context, we are addressing two open questions. The first one focuses on the aspect, if it is possible to design a robust multi-view normal field integration algorithm, which can integrate noisy, imprecise and only partially captured real-world data. Secondly, the question is if it is possible to recover a precise geometry of the challenging highly-specular objects by multi-view normal estima- tion and integration using such an algorithm. The main result of this work is the first multi-view normal field integration algorithm that reliably reconstructs a surface of object from normal fields captured in the real-world setup. The surface of the unknown object is reconstructed by fitting a surface to the vector field reconstructed from observed normal samples. The vector field and the surface consistency information are computed based on a feature space analysis of back-projections of the normals using robust, nonparametric probability density estimation methods. This normal field integration technique is not only suitable for reconstructing lambertian objects, but, in the scope of this work, it is also used for the reconstruction of highly-specular objects via multi-view shape-from-specularity techniques. We performed an evaluation on synthetic normal fields, photometric stereo based normal estimates of a real lambertian object and, most importantly, demon- strated state-of-the art results in the domain of 3D reconstruction of highly-specular objects based on the measured data and integrated by the proposed algorithm. 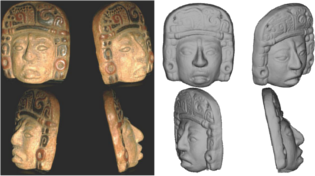 Our method presents a significant advancement in the area of gradient information based 3D reconstruction techniques with a potential to address 3D reconstruction of a large class of objects exhibiting complex reflectance behaviour. 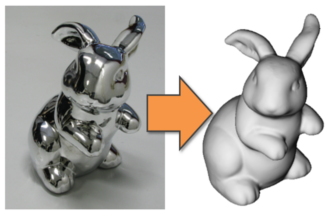 Furthermore, using this method, a wide range of proposed normal estimation techniques can now be used for the recovery of full 3D shapes. In this paper, we propose a 3D reconstruction approach which combines a structured light based consistency measure with dense normal information obtained by exploiting the Helmholtz reciprocity principle. 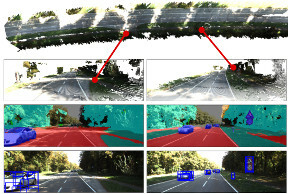 This combination compensates for the individual limitations of techniques providing normal information, which are mainly affected by low-frequency drift, and those providing positional information, which are often not well-suited to recover fine details. To obtain Helmholtz reciprocal samples, we employ a turntable-based setup. Due to the reciprocity, the structured light directly provides the occlusion information needed during the normal estimation for both the cameras and light sources. We perform the reconstruction by solving one global variational problem which integrates all available measurements simultaneously, over all cameras, light source positions and turntable rotations. For this, we employ an octree-based continuous min-cut framework in order to alleviate metrification errors while maintaining memory efficiency. We evaluate the performance of our algorithm both on synthetic and real-world data.